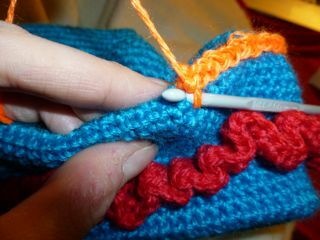 Attach the next colour six rows down the skirt and repeat the instructions above. Continue until you have six ruffles. 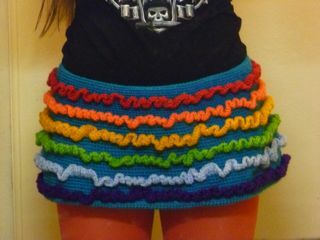 It will be easy to keep your ruffles in a straight line if, when you are crocheting the first round directly onto the skirt, you fold along the row so that you can follow the line of your fold. 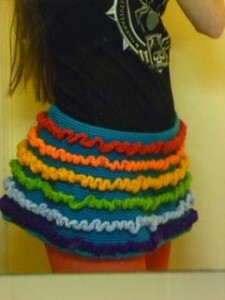 When crocheting the ruffles, hold the skirt with the hem up (away from you) so that the ruffles aren’t upside down. For the ruffles, if your skirt is 50 rounds long you can follow the ruffle instructions as above, otherwise just consider the length of the skirt and what would be an even spacing for the ruffles.